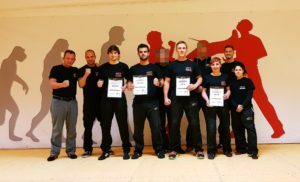 True to the motto: “earned, not given” yesterday, four participants successfully passed the KRAVolution Instructor Course in Germany at the Krav Maga Institute and can now call themselves KRAVolution Civil Instructor! The participants went through an intensive course that was not just about learning the structures of a self-defense training, but above all about becoming a good instructor. That was in Part III with Megan Cohen Berkman a special focus. Furthermore, in all parts they did a intensive technical training, focusing on the most important checkpoints and common mistakes to further promote the teaching aspect. All participants were tested over two whole days. The first day was about teaching: Teaching-Test. Each participant had to hold a previously planned lesson for the other participants. This lesson was assessed by a four-member testing committee, consisting of active KRAVolution Instructors. On the second and last day of the CIC, it went into the Level-Testing. After more than five hours of non-stop testing, which was again accompanied by a four-member testing committee, it went into the final spurt. Everything was demanded of every single person! ”Never give up” was the motto here! Every participant can be proud of himself and his development! We are very proud to welcome you to our KRAVolution Instructor Team!